“Mom, someone’s at the door!” Do you wish there was a better system for being notified that a visitor has arrived? We are here at your rescue with wireless doorbell reviews you can count on. To help you find the best wireless doorbell, we researched a variety of new and best selling products. You will find the top ten doorbell kit selections below. 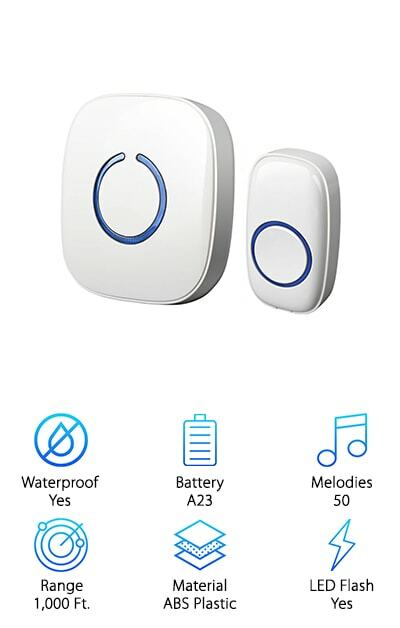 You’ll love the modern wireless doorbell! Now: Before we get started, here’s what you need to know when shopping. 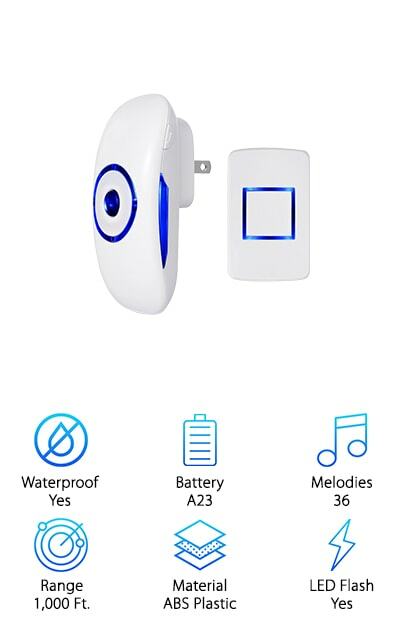 Waterproof: A waterproof wireless doorbell is out there, ready to endure wind, rain, and snow as it sits on your front door. We made sure to include great water-resistant selections on our top ten list. Read on to find the best! Battery: A variety of battery options are used for the best WiFi doorbell picks. For many of the ones we chose, replacing the battery is as easy as picking up a new one at the store. Check this category for more. Melodies: Does a simple “ding, dong” chime satisfy you, or are you looking for a wireless doorbell button that plays Mozart? We have both! The number of tunes available for your selection is listed here so you know how to choose. Range: Some long range wireless doorbell choices can be heard 100 feet away. Others will reach 1,000 in an open area! If you want to hear your next doorbell from the backyard or another far-reaching spot, check this category first! Material: You might be hunting for a certain look when it comes to the doorbell of your dreams. Luckily, they’re all represented here. In this category, we will let you know the doorbell’s material, indicating its construction and its appearance. LED Flash: It’s easy to press a doorbell and not know if it registered, or if sounds were transmitted to a home’s occupants. With an LED flash, you get a clear, shiny indication that the press of your finger was successful! Now that you know how to pick a great wireless doorbell to alert you to important guests, it’s time to get to the reviews. Here’s the deal: If you’re in a hurry, take a look at the top pick and the budget pick. Both are fantastic products and are among the best wireless doorbells we found. Right below, you'll find the remaining 8 doorbell reviews. If you're looking for a fabulous wireless doorbell, just read on! Let's get started! This plug in wireless doorbell is a clear winner in our book. How does it work? The square, ABS plastic remote transmitter button is installed wherever you need it to go. Both anchors and screws and a double-sided sticker are included. The necessary A23 battery for the remote button is there, too. Put the button up, and select from over 50 different chimes and melodies. The other half of the package is the plug-in receiver. Plug it in inside your home, your warehouse, your office…. In the ideal spot for your brand-new doorbell. You will marvel at the range of this device, which extends over 500 feet. It can be heard at 1,000 feet in an open area! Anyone who presses the button will also see the round LED light indicator flash, so they will know everything is working properly. Your delivery driver, your mailman, your neighbors will all be happy to know they can reach you easily. Have you ever missed an important package because you didn’t hear a knock at the door? Do you get frustrated by your standard, built-in doorbell that sometimes does not register the pressing of a finger? It's time to upgrade with our budget pick, the Boomile Wireless Doorbell. This is a sleek and sophisticated option that would not look out of place in front of a condo or at a corporate office entrance. Made from plastic, its ergonomic shape curves and hugs the wall gently wherever it is placed. Inside, you plug in the receiver and wait for the first friend to arrive. Once the square button is pushed, the receiver lights up as well in addition to playing the sound of your choice. With over 36 combinations to choose from, the music and light won’t have you dealing with any more guessing games. This doorbell will travel 1,000 feet in an open area. It is also water and weatherproof. The smart home is no longer a futuristic concept. More and more devices are being created that help our home communicate with itself, and keep us safe. 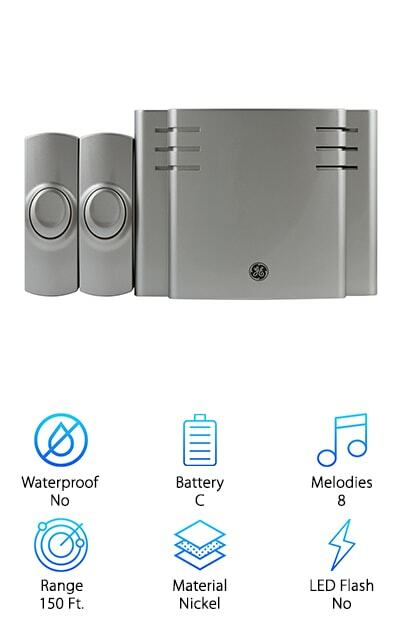 Start with the Honeywell Wireless Doorbell, a security device with the potential to connect to additional advanced security options. What are we talking about? The push button is a slim, white plastic piece that arrives with the necessary battery. Use the surface-mount configuration to place it in the right spot, where it will hold its clean color for a long time. It will also tell you when battery power is running low. The chime is portable, and it can travel with you as you work. If you are running the vacuum, or you have someone with hearing issues inside the home, it will light up along with the sound of the chime. Pick from 6 different melodies in all. You can even turn the chime part off if a child is napping! If simple and classic is what you’re looking for, the GE Wireless Door Chime is a prime choice. You’ll love the look of this wireless doorbell, made from brushed nickel. You will actually love both of them since the set we chose comes with two different push buttons and one receiver. Perhaps you have two entrances, or you'd like to use both buttons to increase the range – each has a 150-foot radius. Whatever the setup, these are highly functional and intuitive machines. Choose from 8 different melodies. You can even select different tunes for the two different doors, so you’ll know where someone has arrived. If two isn’t enough, you can add up to two more. 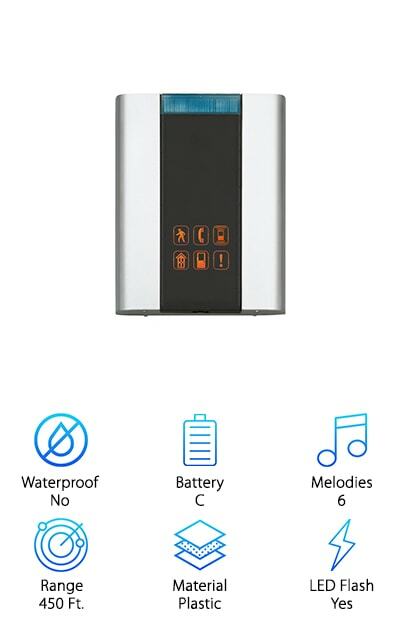 The door chime functions with the help of 3 C batteries. Volume control is included. It is portable, so if you’re cooking in the kitchen or working in the home office, you can keep it nearby. How easy is that? Try it out today! A great wireless doorbell system can make your life much easier. They are so incredibly simple to install and to use, you will wonder why you didn’t think of it before. For example, if your home has a gate in front, the doorbell can be placed there. Use them in the spots that benefit you and your family! The 1byone Easy Chime Doorbell has a compact design. The chiming receiver unit can go right up on the wall somewhere, or it can stay portable. All of the hardware you need to mount it is included. The push button comes with two options for installation: Adhesive tape, or screws. If you don’t like using sound, select the LED display option for alerts, or turn on both. It gets better! This is a waterproof set, and it is expandable too. Do you need to set up a system throughout a warehouse? Up to 5 push buttons can be paired with every receiver. The AVANTEK Chime Kit has one of the widest ranges of any of the wireless doorbell items we are featuring. That's not the only advantage, however, to this awesome system. Here's the scoop: This highly affordable kit includes a transmitter and 2 plug-in receivers. If you have a downstairs and an upstairs in your home, you can spread the receivers out to get necessary alerts. You can even place one outside since the AVANTEK system is weatherproof and dustproof. That ultra-long wireless range is a whopping 1,300 feet. Not only that, these communications will not interfere with anything else set up in the area, like wireless internet. It sounds great, too. There are 52 melodies to choose from. 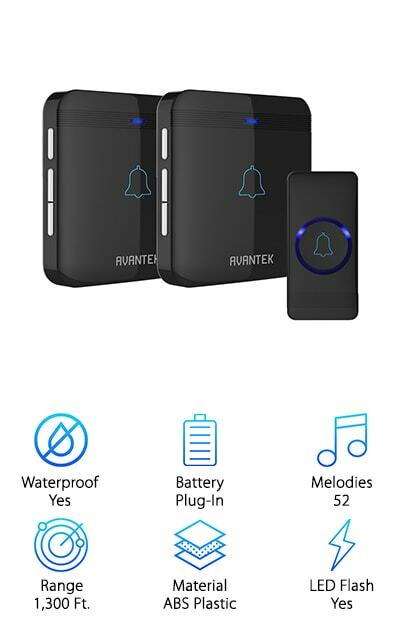 There are 5 adjustable volume levels for each. Finally, there is the impressive memory function. If a storm wipes out the power, the transmitter will retain your latest melody and volume choice once it is restored. It is extremely user-friendly. There is nothing better than the feeling of being safe in your own home, office, workout space or any other location where you require additional peace of mind. 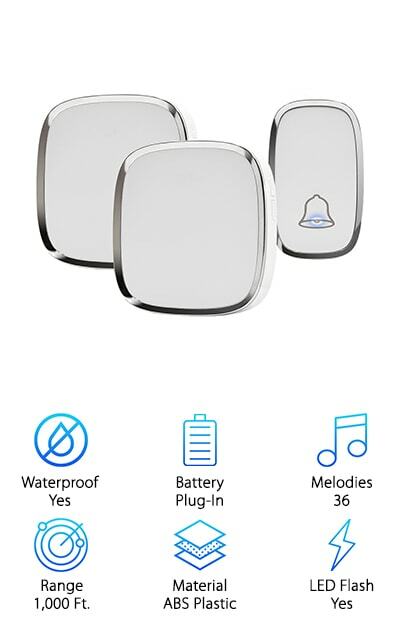 It’s also nice to have choices, which is why our reviewers wanted to make sure to tell you about the Bodyguard Wireless Doorbell. Dust, rain, storms and high temperatures don’t stand a chance against this sturdy little gadget. If that isn’t enough to convince you, it also comes with a lifetime money-back guarantee. This is a sustainable and low-power device. You will get 1 push-button transmitter to place at the front door or another ideal spot, and 2 plug-in receivers. You will get long-distance control, with a thousand-foot range. 36 different ringtones mean you can select what sounds best to your ears. The volume can be adjusted as well. The bell on the front will also flash! It is very easy to install, and it stays in place without issues. If you’ve got a regular doorbell at home, you might be wondering what the advantages are as far as wireless is concerned. Let’s begin with ease of use, shall we? 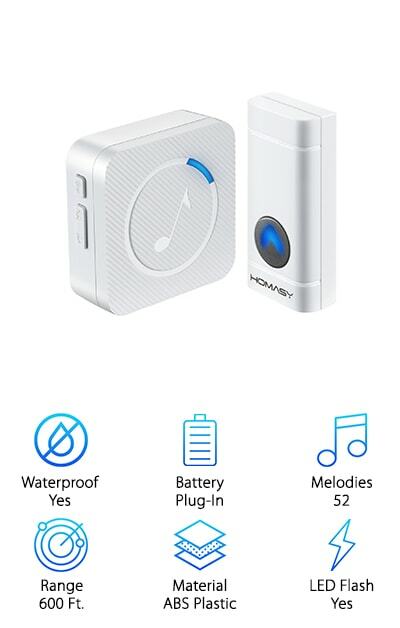 The Homasy Wireless Doorbell Kit, for example, can send those chimes ringing from 600 feet away. Each kit comes with a weatherproof push button, that needs to either be taped or screwed into the wall. Plug the receiver into a wall outlet, select from 52 different ringtones, and you are in business. If you’ve ever struggled to figure out if a delivery is being made, or you have a large house or business facility where sounds disappear before they can reach you, you need to try this on for size. Why? Because you can expand each receiver with up to 50 transmitters! The manufacturer tests each transmitter for pushing 10,000 times a day, so the battery is going to last a long time. Every Homasy product has a 12-month money-back guarantee. There’s a misconception that wireless devices should be kept and used indoors, but it isn’t an accurate one. 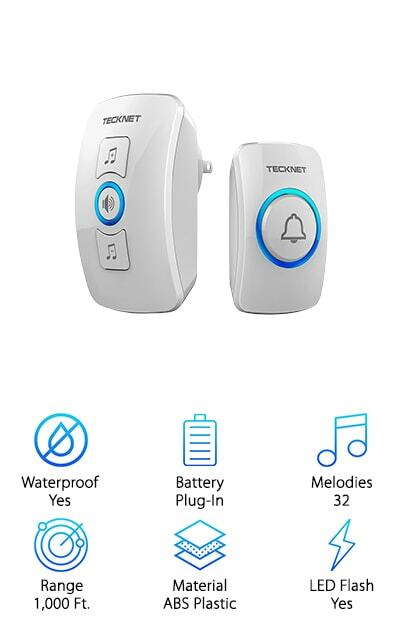 Especially when it comes to the TeckNet Remote Doorbell, which is weatherproof and built for outdoor use. It’s got a very intuitive design, with a push-button transmitter and an easy-to-understand receiver. Double-sided adhesive tape and screws are the two options for mounting the transmitter, and the receiver plugs directly into the wall. You get both sound and light when someone arrives. The blue LED light flashes, and you can also program one of 32 different sounds. Each can be set to 4 different volume levels. The memory function will hold on to your preferred tune and volume setting, even after a power outage. The receiver can “speak” to the transmitter from up to a thousand feet, a wide range for both a home or business setting. Other users can’t interfere, either, since the TeckNet has 64,000 available codes. There’s also an 18-month warranty. If you have a front door camera doorbell improvement is also recommended. How do wireless doorbells provide added peace of mind and security? First of all, the PHYSEN Doorbell can transmit news of a guest for up to 1,000 feet. It will travel up to 700 feet, even through metal doors and security areas. You don’t only have to use them for home or business entrances. They also provide marvelous assistance for the elderly, children and people who are bedridden. They can hold on to one of the two remote push buttons or keep it nearby for when help is needed. 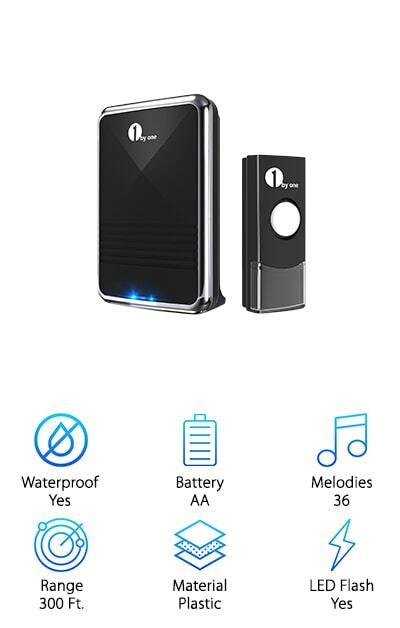 And with 52 different melodies available, the person in need of assistance and the push button at the front door can choose two different songs. That way, you know which way to head when you’re called! Place the 3 plug-in receivers wherever they’re needed. 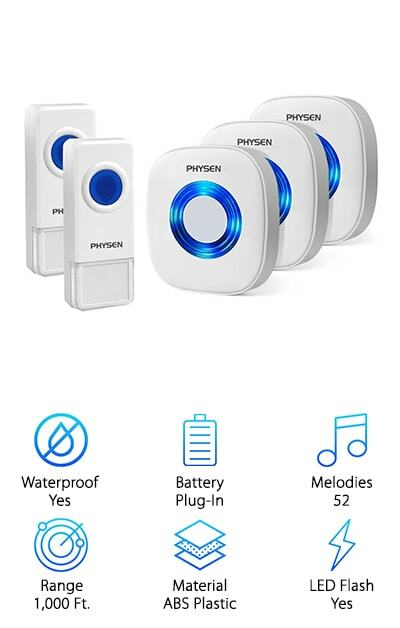 This weatherproof device comes with a lifetime worry-free guarantee from the fine folks at Physen.